Registration for the 41st Annual Red Parka Pub Challenge Cup is now open and available online here. The race is set for Friday, March 14 at Attitash Mountain Resort in Bartlett, New Hampshire. The deadline for registration is March 9. The cost is $60. Registration will be open on the day of the race for a race fee of $70. We’ll be hosting the bib draw on the night before the race at the Red Parka Pub at 7 p.m. At that time, we’ll be raffling off bib 1 & 2 for charity and have a ton of raffle prizes to give away. Get ready for another great pre-race event on Thursday, March 13. All proceeds from raffles and race fees go to the Eastern Slope Ski Club. Get your registration in early and get ready for another great event! The longest-running, pro-style dual giant slalom race in the country is gearing up for its 41st annual event this March. Join us at Attitash Mountain Resort on Friday, March 14, 2014 for the big event. More details to come! A glance of all the action on the course, shots of spectators and scenes from inside the finish building. The photos in this photo link are free for use for all press-related material about the Red Parka Pub Challenge Cup. Please credit Laura Tuveson in print/web publications. The 40th Annual Red Parka Pub Challenge Cup was held on Friday, March 15 at Attitash Mountain Resort. There were 117 racers that participated in today’s event, which is the longest running pro-style dual GS in the United States. Proceeds from today’s event benefit the Eastern Slope Ski Club, a Mt. Washington Valley-based non-profit organization that funds grade school skiers in the Mt. Washington Valley. “This year’s race brought in more racers than we’ve seen in several years,” said Terry O’Brien, owner of the Red Parka Pub and event organizer. All racers get two runs for the qualifying round, which is held in the morning. The top 32 racers square off in the afternoon, with several categories of winners, based on division. Division A competes to be crowned the official champion of the Red Parka Pub Challenge Cup. This year, four-time winner Ben Drummond squared off against rookie Ace Tarberry in the finals, with Tarberry beating out Drummond to be crowned the 2013 champion of the Red Parka Pub Challenge Cup. Official finishes, based on division are listed below. The 40th Annual Red Parka Pub Challenge Cup will get underway shortly at Attitash Mountain Resort, with qualifiers beginning at 9:30 a.m. Keep track of the racing and the day’s results on live-timing.com. Finals will begin after lunch around 1 p.m. Join us for all the excitement on Spillway and all the action at The Bump! Two area ski racing leagues will be setting practice courses this week for the 40th Annual Red Parka Pub Challenge Cup scheduled for Friday, March 15. Participants in the Attitash Race League will have the opportunity to go head-to-head in a dual course this week on Spillway at Attitash Mountain Resort. This is the same course that is used for the Red Parka Pub Challenge Cup, so it’s a great way for racers to get a feel for the course. The course will be open from 9 a.m. to 2 p.m. on Tuesday, March 5. Participants in Cranmore Mountain Meisters can go head-to-head on a course separate from the NASTAR course where regular runs are timed at this Wednesday race league. This separate course will be available and open to anyone and will feature a pro bump, providing excellent practice for the Challenge Cup. The fastest male and female of the day, who have never raced in the Challenge Cup, will get 1/2-off of the entry fee for the Challenge Cup. The course at Cranmore will be open from 9 a.m. to 4 p.m. on Wednesday, March 6. We’ll be inducting 24 racers/race crew members into the new Challenge Cup Hall of Fame this season for the 40th Annual event. The Hall of Fame display will be at the Red Parka Pub where the infamous pub payphone was previously located. The induction ceremony will be on Thursday, March 14 at 7 p.m. following the race’s Bib Draw at 6 p.m. in the pub. We’ll be honoring the inductees with “Red Parkas” supplied by Hurricane Racing and sponsored by Head, Attitash Mountain Village, Eastern Slope Inn and a generous private donation. 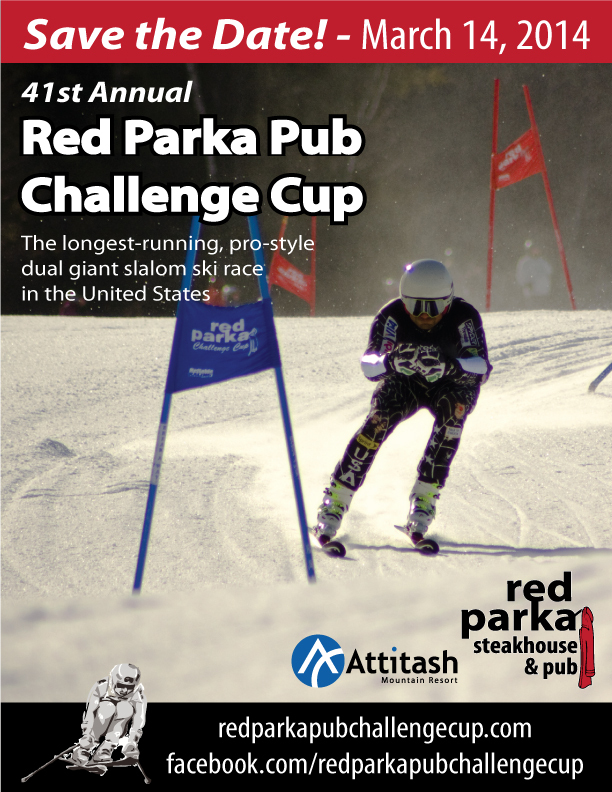 The Bib Draw and Hall of Fame Induction will be on the eve of the 40th Annual Red Parka Pub Challenge Cup Race, scheduled for Friday, March 15 at Attitash Mountain Resort.